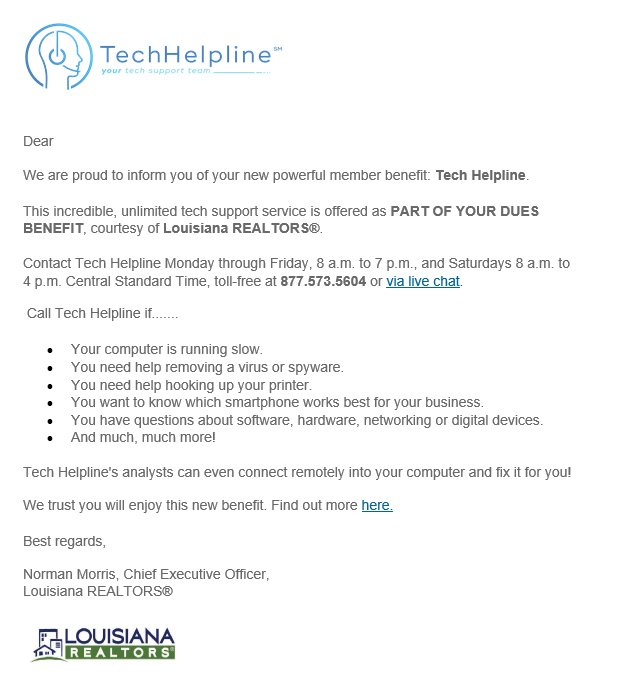 Louisiana REALTORS® launched a new member benefit, Tech Helpline, on January 2, 2018. The service provides U.S. Based Tech Support to help troubleshoot and resolve challenges with office and personal tech devices. "LR recognizes that experiencing downtime with technology could keep REALTOR® members from being able to service their clients and hinder their productivity. Staying true to our mission to provide optimum member resources, we sought out this great service that supports nearly 600,000 practitioners and understands the unique needs of the real estate industry," said Norman Morris, CEO. Members should have received the following email message notifying them of this new service that is being provided at no additional cost. The message is not spam or a phishing attempt, but information that will help access the service. For the full list of what is covered, click here. REALTORS®can also access more information from the Tech Helpline webpage. For specific questions, please contact Amy P. Fennell - Director of Communications & Member Services.